My iPad has left the factory! I woke up this morning to discover it entered the UPS system in Shenzhen at 4:30 AM China time. It will take several days to cross an ocean and a continent. This leaves me plenty of time to wrestle with Apple expectation and my buyer’s remorse. Apple expectation is a wonderful place to be. It’s that gap between hearing about the latest gizmo from Cupertino and owning one. It is encouraged by press coverage, fan boy speculation, wild rumors and eventually those lines at Apple retail. The only real question: will this gizmo be as great as Steve says? Or will it be much, much better? Buyer’s remorse is another matter. This uncertainty haunts the purchase of every big ticket item. And it’s a special problem in the tech world. I bet 20% of our tech purchases disappoint; phones, computers, cameras and software we didn’t like or didn’t use. When it comes to technology, you pays your money and you takes your chances. There are special grounds for buyer’s remorse in this case. Some experts say the iPad must fail. Smart phones deliver music. Laptops deliver movies and ebooks. 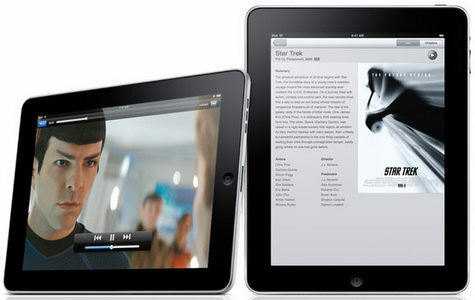 The iPad is fighting for an excluded middle, they say, a market that doesn’t exist. I think the critics are wrong. I think the iPad will be a smash hit. I think it will find a place in our lives by making a place in our lives. I think it will change the way we use media. Here’s how. My smart phone is too small to show movies. My ThinkPad, with its 256 GB of cluttered storage, is too small to store them. I need is a big screen. And I need storage doesn’t act like a loading dock, with me shuttling things in and out. I want room enough to install several movies and leave them there. Is this just me? Surely, everyone needs access to movies and TV. These are the great conduits of our culture. Perhaps, more important they are our respite in times of crisis. Like being being stuck in an airplane or an airport, surrounded by crowds and screaming children. The moving image, as Jet Blue discovered, is a great palliative. One wants to be prepared. iPad looks like preparation. It will be our prophylactic against the horror of air travel. Second, most of us now most hours of the day, laptop in place. Even when we break for newspapers and magazines, we remain on line. So the laptop remains in place. This is a problem. It means carrying our work frame of mind into our reading frame of mind. When working, we are hard-charging and results oriented. When reading, we are more contemplative. We read each story and opinion to see if it’s a) interesting, b) useful and if it isn’t, we spin it on an axis to see if and how we can make it interesting. (For some reason, I find squinting seems to help this process, but probably that’s just me.) Getting my news and editorial into the right form will help me use the right frame of mind. If this gives me access one better idea a month, the iPad will pay for itself in short order. Third, too much work makes us dull boys and girls. The last thing I want to do at the end of a long day on my ThinkPad is to watch a movie on my ThinkPad. The very point of the exercise is to put a little separation between work and leisure. Without it, my leisure time doesn’t have the same recreational effect. If the iPad can help restores this, it will serve me very well. In all of this, iPad is creating its own market between the smart phone and the laptop. We could call this a “white space” or a “blue ocean” but I prefer to think of it as a “third space.” In the manner of Zeno’s paradox (and, yes, Starbucks), Apple managed to split the difference between existing categories, and honor the way the consumer sees entertainment, contemplation and recreation. The iPad critics can’t see this third space because they work from a utilitarian point of view. For them, iPad will create economic value only if it solves practical problems. But Apple has always seen the economic proposition as a cultural one, as an opportunity to speak to the entire consumer in all of his or her complexity, not just the problem solver. So I say the iPad will flourish. Now if only the doorbell would ring. Post script: I have used iPad for several weeks. It’s strange to go back to a paper newspaper. It feels like going back to a IBM Selectric typewriter after the launch of personal computers, really clumsy and laborious. How quickly we adjust. And, against Scitovsky’s "joyless economy" notion, it seems to me that it will be a very long time before the pleasure of using an iPad turns to mere comfort. Scitovsky, Tibor. 1976. The Joyless Economy: An inquiry into human satisfaction and consumer dissatisfaction. New York: Oxford University Press. * This just in: Carl Howe says "Apple’s iPad will likely take the crown for the fastest consumer product growth to the $1 billion revenue mark in history, taking less than 120 days from announcement to reach that milestone." Howe, Carl. 2010. A New Record for Apple. Seeking Alpha. May 5. here. This entry was posted in Uncategorized and tagged Apple, Carl Howe, iPad, Scitovsky, selectric, third space on May 6, 2010 by Grant.